Actually F-Response provides access to these remote data sources a variety of ways. For devices F-Response creates an AES 256bit encrypted and compressed connection to the remote machine and presents the drives or volumes of that machine as local, read-only, physical devices on your examiner machine. How is F-Response Enterprise different? F-Response Enterprise is the unlimited covert subject version of F-Response. Simply put this means with F-Response Enterprise edition there is no limit to the number of remote covert subjects at any given time. In addition, F-Response Enterprise deployment and connectivity was designed to be covert and efficient allowing the investigator to access multiple machines quickly without concern for alerting the end user. I'm a consultant, can I use F-Response Enterprise on site at a client? Yes! F-Response was designed by consultants for consultants. Our licensing allows you to use F-Response Enterprise while onsite at your client or while connected to them through a virtual private network. Interested in using F-Response Enterprise as part of an inexpensive Managed Services offering? Check out our complete pdf/xps on leveraging F-Response to extend your consulting practice over the Internet. F-Response provides direct, live, read-only access to the remote target computer's disks, volumes, and in certain cases physical memory. Since all access is at the physical level there is no file level locking, F-Response gives you access to any and all content on the remote target, including protected system content (Registry files, Email PSTs, Database Files, etc). F-Response includes optional installation packages complete with gui tools and scriptable command line components for Linux and Apple OSX. F-Response includes an optional high speed fully scriptable imaging capability to create physical, virtual, and custom content images of F-Response presented devices and shares. The F-Response Enterprise functions as a single executable ("exe") on the remote target computer that requires no drivers or installation components, as well as no reboot when deployed and started. F-Response is 100% Windows 10 tested. F-Response includes industry standard support for AES 256-bit Encryption for connections. F-Response encryption is seamless and native in all versions of F-Response. The Flexdisk(TM)(Patented) is a web based disk access and representation tool. The Flexdisk uses standard web technologies (HTTPS/REST ) to provide direct access to the remote target machines Logical and Physical targets in both raw and logical format. The Flexdisk can be accessed and used from any modern web browser and also exposes a feature rich and extensible application programming interface (API) accessible from any system capable of making and interpreting web queries and JSON . F-Response works with all RAID disks, physical drives, logical volumes, and physical memory (32 & 64 bit Windows). In addition, F-Response Enterprise includes target executables for over ten (10+) operating system environments, including exotic hardware such as IBM AIX and Solaris. Furthermore based on its unique vendor neutral patented design, F-Response works with all Computer Forensics, eDiscovery and Data Recovery software packages, simply put, if your package reads from a hard drive, it will work with F-Response. F-Response Enterprise includes unlimited installations, connections, and examiners for a period of one or three year(s) from the date of purchase. Software will cease to function at the end of the license duration unless renewed. In addition, F-Response Enterprise Edition includes a license for F-Response Consultant, Field Kit Edition, and allows true many-to-many connectivity from any examiner platform. 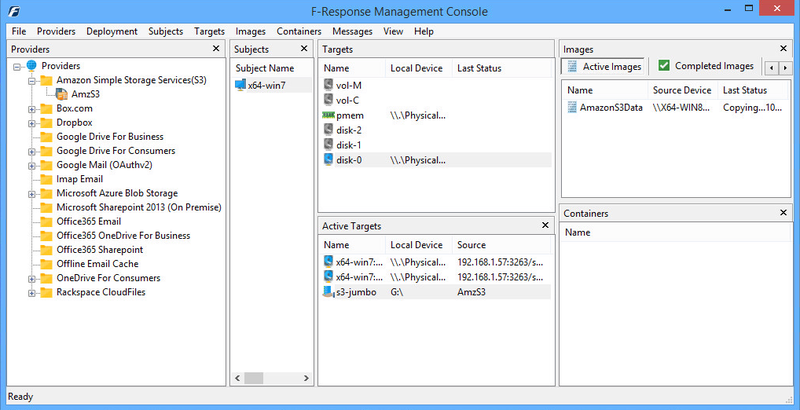 F-Response Enterprise Edition includes access to a fully scriptable COM library capable of automating many of the F-Response Management Console tasks from any programming environment that supports COM. 1 Gigahertz (GHz) processor or faster, 1 Gigabyte (GB) of RAM for 32-bit or 2 GB of RAM for 64-bit systems, at least 20 Gigabytes (GB) of Disk Space. Interested in trying F-Response Enterprise risk free in your environment? Use this link to contact Sales and arrange a brief GoToMeeting demonstration, after which we can give you direct access to our virtual dongle so you can begin testing F-Response Enterprise in your environment immediately. To Purchase F-Response Enterprise Edition online via credit card go to Purchase F-Response Software or request a quote. We do accept purchase orders following a completed credit application, to request a credit application contact F-Response Sales and Support. If you would prefer to use a local reseller you are welcome to review our list of resellers by country here.